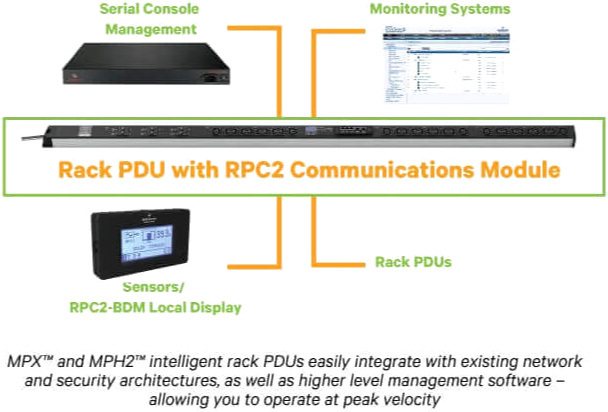 Vertiv MPH2 Managed Rack PDU offerings deliver remote monitoring and control capabilities in a range of models. The Vertiv MPH2-B provides basic power monitoring. Available in a range of form factors, each MPH2-B models provides metering at the input and branch level. Specification Vertiv MPH2 B: Metering per phase and per group. The Vertiv MPH2-B Managed Rack PDU is the entry-level solution in the Vertiv MPH2 family. This system ensures reliable power management with remote monitoring and control capabilities. The Vertiv MPH2-B provides monitoring of input power and phase power in three-phase models, with 0U, 1U or 2U options and multiple input/output voltage and outlet configurations to meet any need. With seamless appliance and application integration across various systems and platforms, including KVM switches, management gateways and DCIM software, the Vertiv MPH2-B simplifies power management at the rack level in enterprise, hyperscale and edge environments. This model (MPHB2141) is single phase with 20A capacity and input/output voltage of 100-240V in a horizontal form factor. It has 12 C13 outlets. This MPH2 Managed Rack PDU is designed specifically to accommodate higher power densities and be resistant to higher temperatures. It easily integrates with existing network and security architectures, as well as higher level management software - allowing you to operate at peak velocity. Energy and power metering provides users the information to maximize the data center power and cooling infrastructure. Modular hot swappable controller card separates power distribution and communications, enabling continuous distribution when a communications module fails or is replaced. It allows you to predict failing conditions before they occur and proactively manage connected equipment for maximum uptime. Power and environmental trend reports through integration with Avocent Rack Power Manager, Liebert Nform and the Trellis platform - improved monitoring, control, and reporting of trends. Lowest power consumption of all switched rack PDU designs ensures lower operating costs for datacenter. 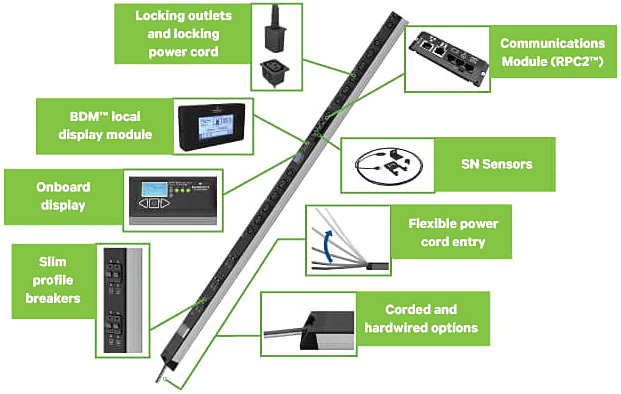 The MPH2 provides full featured monitoring and control in a cost effective package. A Rack PDU Array shares a single IP address for up to four rack PDUs, making deployment faster and easier.